Denim is by any means the most popular single fabric type across the world. No other particular variety of a fabric has gained such widespread acknowledgment globally across the users. The best part is that it is equally accepted among different races, age groups, genders and income slabs. We largely are aware of the history of denim fabrics today. Most of us know that it was extensively used by sailors because of its durability and strength. At the same time, it was comfortable to wear, and very significantly, it could be worn without frequent washing, which was probably a big reason why it was so popular among the seamen. Since much of this part of the story is already known, let’s discuss something else out here. 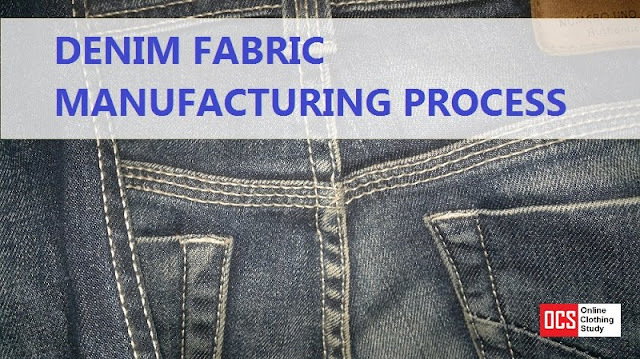 We will focus on how a denim fabric is made. Our attempt will be only to lay down a general guideline for anyone wishing to produce a denim fabric. The special properties of denim fabrics are mostly attributed to the yarns. It is the technique in which the yarns are made that bring in certain value additions to the fabrics like strength, rugged look and reduced need for washing. For denim fabrics, we use a separate way of making the yarns, known as open-end spinning. Here, we have a device called the rotor that collects the cleaned loose fibres inside its hollow groove. 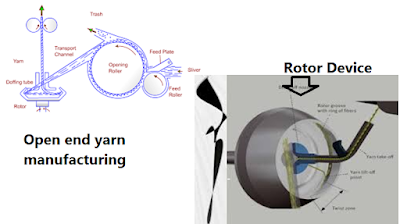 As the rotor keeps rotating at a high velocity, the centrifugal force generated pushes the yarns along the periphery, from where they are collected by a rotating tail of a preceding yarn where the fibres cling on to produce a new yarn. This yarn is called an open-end, or often a rotor yarn. The vector difference between the rotation of the rotor and that of the yarn tail about its axis imparts the much important twist to the yarn. But the twist here flows from inside to outside of the yarn, i.e., the fibres nearer to the longitudinal axis of the yarn are more twisted than the ones on the surface. This also means that the longer fibres will tend to lie nearer to the axis of the yarn than the shorter ones. Why the loose fibres cling on to the tail yarn is attributed to the surface configuration of the individual fibres. Since cotton is the most common fibre used, which has a rough surface, it generates enough friction among the tail yarn and the loose fibres so that the later gets attached to form the new yarn. Since the shorter fibres stay mostly on the yarn surface, hence during usage, the regular abrasion makes them protrude out of the yarn body and impart the rugged look of the denim. However, as the longer fibres remain embedded inside the yarn body, the strength and durability do not degrade, unlike ring spun yarns, the most common variety, that would show a reverse trend with frequent abrasion. Generally, the yarns required for denim fabrics are coarser in nature so that they can sustain the wear and tear. The normal single yarn count starts with 6s (6^s) and the most common ones are 8s, 10s. 12s and 16s. Even 1/20s yarns are used often, but finer yarns like 1/24s and 1/30s are rarely used. Those beyond 1/30s in fineness are generally not used. For 2-plied yarns, the resultant count remains in the same range as that of the single yarns. The yarn count is normally written as the following image. Denim is a fabric with the warp sheet dyed and the weft left greige. It simply means that the warp yarns will be dyed in the form of a sheet or in rope form, which will be used further in weaving. The weft yarns will be left undyed, or in fact untreated, and inserted in weaving. The most common dye used for sheet dyeing is the indigo. It is a natural dye that is a vat dye by nature. Thus it is insoluble in natural vat form and has to be reduced into leuco-vat form to make it soluble. In the reduced form, the dye, being soluble, enters the amorphous regions of the fibre polymers of cotton. There is hardly any chemical bonding between the fibres and the dye, and the coloration takes place simply by the stearic mechanism. After the dye enters the fibre polymer matrix, it is oxidised so that it returns to the original vat form. In this form, the dye is insoluble again. So when washed, it won’t come out of the fibre or bleed, thereby giving excellent wash fastness properties. In order to facilitate the process, a high temperature is required. In many cases, the dyeing temperature is 60OC. but the more common temperature is 80 OC while for some dyes, it can be as high as 95 OC. The dyeing temperature is dependent on certain factors, the most important being the nature of the indigo dye. The fineness of the yarn also matters a lot, with coarser yarns demanding higher dyeing temperature for better penetration. A higher dyeing temperature helps in easier solubility of the dye in leuco-vat form, better penetration, and more uniform dyeing. Indigo dyes are most common in case of denim since indigo dyes were traditionally used since the old days. Today, the natural indigo has been replaced by the synthetic indigo dye which has higher exhaustion in the dye bath. Therefore, the wastage of the dye is lesser, making it more economic for the dyer. But it also brings down the eco-friendliness of the process, owing to the fact that many other chemicals like dispersing, exhaustion, fixation and sequestering agents are also used in the dye liquor. The process of reduction of the dye followed by oxidation requires quite a complex mechanism to be incorporated. Instead of chemical oxidation, many manufacturers prefer aerial oxidation process. This reduces the cost involved as well as the toxicology of the dye effluent, but at the same time, it calls for machines that are huge in size. If dyeing is done in yarn form, a Sheet Dyeing Machine is generally used. But in case dyeing is done in sliver form, a Rope Dyeing Machine is required. In the latter, the slivers are dyed before their conversion to the yarn, and the dyed slivers appear as ropes in the machine, hence its name. A Rope Dyeing Machine may take up a huge space on the shop floor that can otherwise accommodate 3-5 Sheet Dyeing Machines. But at the same time, the Rope Dyeing Machine can deliver almost 10 times the production of one single Sheet Dyeing Machine. 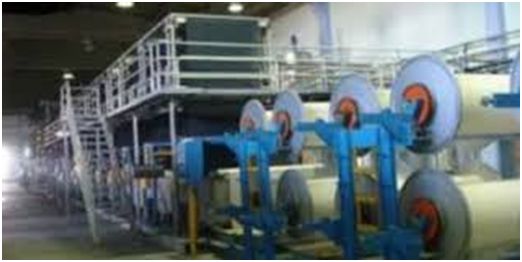 Rope Dyeing Machines thus suit orders of very large quantities but for smaller quantities with frugal requirements, the Sheet Dyeing Machines are more suitable. Another important stage prior to the dyeing is the density of the yarn or rope. In case of warp yarns, the tightness of the warp sheet on the warper’s beam is important for dye pick-up. A tighter (or higher) density may affect the dye exhaustion and vice versa. In case of rope dyeing, it is the density of the sliver that is very important. A higher density can hinder dye penetration and hence the pick-up. In denim fabrics, weaving is perhaps the easiest part. Denim fabrics are made out of 2/1 twills in most cases although other twills are often used. There are plain woven denims available as well. With a greater variety of usage of denims in ladies’ apparel, shirts and jackets, and even in home furnishings at times, the weave has been explored to make harsh as well as soft fabrics with varying intensities of drape and limp. Besides the yarn, the other area where value addition occurs in denims is processing. In earlier days, various effects were created simply by washing, but today, other forms of mechanical finishes and chemical finishes as also employed. In denim, vat dyes are mostly used. But they would not bleed in water, even when hot. So, besides hot water, rubbing or abrasion is also induced. In many cases, pumice stones are used for rubbing. As vat dyes do not have any chemical bonding with the fibre, the continuous rubbing at elevated temperatures can cause some of the dyes to bleed. Such preferential washing treatments can not only induce different aesthetic looks on the fabric; they can even change the feel of the fabric into softer tones alongside helping to develop the rugged look much preferred by many users. Besides pumice stones, other methods of washing have also been employed. One of them is enzymatic washing. Each of these methods has different looks and feel to offer. Among the mechanical processes often employed are peach finish, diamond or emery finish and air or sand blasting. These methods are ways to impart softness, silkiness and royal drape to the fabrics. Among the chemical finishes, soil, oil, and water repellent finishes are few examples. Reference: Parmar, M.S., Satsangi, S.S. and Prakash, Jai, “Denim- A Fabric For All”, Northern India Textile Research Association (NITRA) Publication, 196. Acknowledgement: The Arvind Mills Ltd., Denim Unit, Naroda, Ahmedabad, Gujrat, India. Arnab Sen is an Assistant Professor, Textile Design, National Institute of Fashion Technology (NIFT), Bhopal, India. He is a B.Sc.Tech. in Textile Technology from the University of Calcutta and an M.Tech. in Fibre Science and Technology from the Indian Institute of Technology Delhi. He has served the textiles industry of India as a teacher and a professional since 2001. Follow him on LinkedIn. The process of making denim fabric. Yarn manufacturing, dyeing of yarns, weaving, processing and fabric finishing are the major processes involved in denim manufacturing.